Tristan und Isolde: Premiere on Monday, July 25th. Set and costumes: Anna Viebrock. While it's cool to get to Bayreuth given the 10-year-plus waiting list for tickets, it's even cooler to 'dis' it once you've been there, moaning about how middling and dull the productions are. And, to be perfectly honest, the legendary Festspielhaus built on Bayreuth's mythical Green Hill is not really the place if you want to see the very best in Wagner interpretation or hear the very best Wagner singers today. In fact, the small elite of singers who are truly up to the composer's demands are conspicuously and consistently absent from most of the cast lists that cost just 50 cents on the each day of the performance in the opera house built to Wagner's own designs. But that doesn't detract from the uniqueness of the Bayreuth experience. There is something very special about traipsing each day up the Green Hill to Wagner's holy of holies to hear just one of the mere 10 works that have ever been performed there. There is something both humbling and exhilarating in sitting in the hushed auditorium as the curtain goes up and the first chords rise out of the unseen pit. And among all the poseurs that Bayreuth has more than its fair share of, you'll always be able to find very knowledgeable people to debate with at dinner in one of the crowded restaurants in town afterwards. No. For all its artistic shortcomings, there is something endlessly fascinating about this cult month-long summer festival that draws tens of thousands of Wagner fans from all over the world to this otherwise sleepy German Bavarian town. And this year's festival was no exception. The 94th outing of the Richard Wagner Festspiele was one of those Ring-free years, where the old production of the sprawling tetralogy has already been put to bed, while the new one is still in the making. 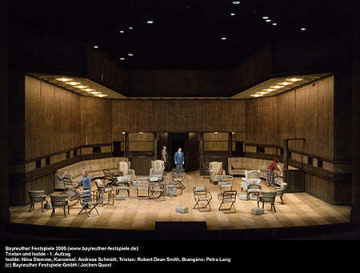 So, this year, five operas were on the bill -- Tristan und Isolde in a brand-new production by Swiss theatre director Christoph Marthaler; and successive revivals of Keith Warner's Lohengrin; Claus Guth's Der fliegende Holländer, Philippe Arlaud's Tannhäuser and Christoph Schlingensief's Parsifal. It was Marthaler's Tristan that opened the festival on Monday July 25th. The first new production of the opera in six years -- since Heiner Mueller's critically acclaimed staging that closed in 1999 -- and only the 10th in the festival's history, the rather dour and obtuse reading sadly failed to live up to expectations. For Marthaler, Tristan and Isolde's ill-fated passion is like a flame that flares up briefly and is then extinguished forever. But his clinical, dispassionate dissection of that passion rendered it possibly the coldest I've ever seen. Only for one brief moment in "Sink hernieder! Nacht der Liebe" is there a frisson of eroticism as Tristan coyly nestles his head in Isolde's lap and gently pulls off her elbow-length gloves. Apart from that, the unhappy lovers do not touch at all. In fact, their passion is depressingly destructive, leaving not only Tristan and Isolde high and dry in their inability to communicate, but also severing the ties between Brangäne, King Marke, Kurwenal and Melot, who in the end are left scrabbling in autistic isolation. Anna Viebrock's spare, minimalistic sets only increased the feeling of loneliness. Act I could have been a saloon on an old, dilapidated ocean liner, a deserted lobby of a run-down hotel or the wood-panelled waiting room of a train station. Act II is the same building one floor down, in what appears to be an empty ballroom with mustard yellow wallpaper, a worn parquet floor and two single Le Corbusier seats. And Act III takes place one floor down again, this time in the cellar with bare unplastered walls. The other levels are still visible above, with simply the floors taken out. Thankfully, the vocal performance was in a different league, with Nina Stemme's Isolde stealing the show. Her warm-timbred soprano was lyrical, wild and passionate in turn, always secure in intonation and showing no signs of pressure even up top. Petra Lang, making her Bayreuth debut at Brangäne, was nearly equal to Stemme, with her gleaming rich mezzo. Robert Dean Smith's Tristan sounded pleasant enough on the ear but lacked any real charisma, while Kwangchul Youn was a good, solid, dependable King Marke who lacked the noble grandeur required to make the role really tragic. Alexander Marco-Buhrmeister was a rather faceless Melot, while Andreas Schmidt was simply miscast as Kurwenal, intonation sometimes woefully off mark. Japanese maestro Eiji Oue, the first ever Asian to conduct at Bayreuth, gave a concentrated reading of the score. But the diminutive conductor, who kissed the floorboards of the Festspielhaus in a gesture of reverence to the composer at the curtain call, never really left his mark on Wagner's magnum opus. The next night saw the revival of US director Keith Warner's spectacularly cinematic staging of Lohengrin, last seen in Bayreuth in 2003. And it provided a fascinating counterfoil to Marthaler's stark European intellectualism. Richly detailed, carefully crafted, skilfully mixing realism with pinches of modernism, Warner's staging has lost none of its magic, thanks to Stefanos Lazaridis' visually striking sets and Ulrich Niepel's poetic lighting. But for all its opulence, this Lohengrin hardly pushes the boundaries in Wagner interpretation. In the title role, German tenor Peter Seiffert received standing ovations, his clarion-clear "Heldentenor" standing out in a generally mixed performance by the rest of the cast. His real-life partner, soprano Petra-Maria Schnitzer, sounded shrill and forced as Elsa in Act I, and failed to convince in the subsequent two acts as well, with her thin, one-dimensional singing and acting. US soprano Linda Watson, tipped to be Brünnhilde in Bayreuth's new Ring next year, sang the role of the wicked power-hungry Ortrud with an unpleasant wobble.Reinhard Hagen as King Heinrich, Hartmut Welker as Telramund and Roman Trekel as the Heerrufer were all unexpectional. 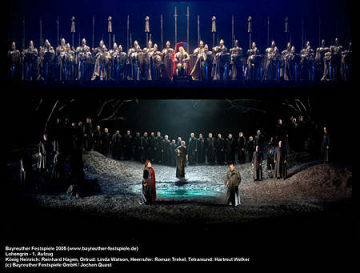 Next on the list for me -- I did not attend either Der fliegende Holländer or Tannhäuser -- was Christoph Schlingensief's startling but exasperating production of Parsifal, that caused such an uproar when it was unveiled here last year. And it polarised critics and audience again this year. In fact, it very nearly came to fistfights between Schlingensief's supporters and detractors when the final curtain came down on Friday. 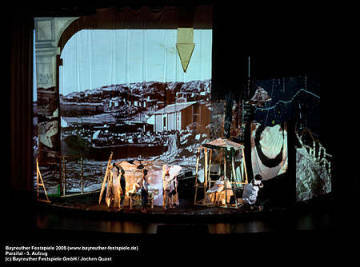 It was the first revival of Schlingensief's staging of Richard Wagner's final opera, with its dizzying, bewildering flood of visuals, since it was premiered in 2004. And although Schlingensief has cut the copious use of video, his voodoo-ridden reading still infuriates, with its complete absence of narrative structure and the main characters reduced to mere chiffres. The stage remains a cluttered, confusing junkyard of a Moor's palace, African huts, and refugee camps complete with electrified fences and prison watchtowers. And the use of doubles for Parsifal and Kundry only adds to the perplexion. Among the constantly recurring video images projected onto screens and across the entire stage was a blossoming flower and a time-relapse film of a rotting rabbit cadaver. For all the distracting visuals, Pierre Boulez, conducting Parsifal for the last time this year, received standing ovations for his fleet, nimble and transluscent reading of the score. The 80-year-old Frenchman's swift and agile tempi meant that Act I ran for barely 92 minutes, while Acts II and III, astonishingly, came in at just over 60 minutes apiece. Nevertheless, there was nothing rushed about his reading, which was elegant and poetic, elastic and cohesive all at once. It was undoubtedly the musical high-point of the entire week. Among the soloists, Michelle De Young stood out as Kundry, unfazed by the vertiginous top notes, while her lower range displayed all the richness and weight that the role -- the maddest that Wagner ever wrote -- requires. Robert Holl's Gurnemanz was smooth and elegant, and Alexander Marco-Buhrmeister was a beautifully plangent Amfortas, even if his bass-baritone was ultimately perhaps a little too light for the role. John Wegner was chillingly dark as Klingsor. Only Alfons Eberz disappointed in the title role, with his ugly, barking tenor. The juxtaposition of these very different productions in Bayreuth this year underlined the wider artistic quandary opera directors currently find themselves in. Should they use publicly subsidised theatres to pursue their own artistic goals even if that means alienating large parts of the opera-going public? Or should they pander to the conservative tastes of their sponsors, offering easily-digestible fare that can be swigged down with a glass of champagne? As public funding for the arts in Germany and in Europe is increasingly cut back, private sponsors are likely to become as important as they are in the US. And that will put a big question mark over the ability of theatre auteurs such as Marthaler or Schlingensief to stage their uncompromising takes on the works of Wagner and other composers. The problem is that without provocateurs such as Marthaler or Schlingensief, European music theatre would be a great deal poorer. Opera needs to provoke strong reactions to survive. If it is homogenised and turned into just another luxury consumer good, no matter how beautifully packaged, then music theatre will really run the risk of turning into a museum-piece that will quietly die without anyone noticing.